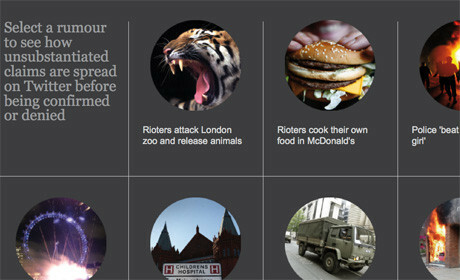 The Guardian was one of six winners announced at the first edition of the Google-supported Data Journalism Awards in Paris today, in recognition for its Riot Rumours interactive. A total of six winners representing five countries were announced on the night, with both international, national, regional and local press recognised across three main categories. The BBC and UK outlet the Detail both also achieved an honourable mention. The awards, which are also organised in collaboration with the European Journalism Centre saw more than 300 applications submitted from 60 countries, narrowed down to a shortlist of nine or ten nominees for each category. The Guardian's Riot Rumours interactive received the national/international award for data visualisation and storytelling on the night, which member of the jury Peter Barron of Google said "jumps out as the most original and compelling piece of data journalism and visualisation". The jury also congratulated the Guardian for creating an interactive which "helps to reveal trends and meaning that would not have been possible using traditional narrative techniques". Alastair Dant, who leads the interactive team at the Guardian spoke at the conference on Wednesday about the Guardian's approach to interactives. Each winner of a Data Journalism Award receives €7,500. On the night The Detail, a website which "aims to help put investigative journalism at the core of the news industry in Northern Ireland" was given an honourable mention within the data-driven investigations category for local/regional media for 'How Quickly Did Help Arrive', described by jury member Paul Radu as a "very clean project with clear applications in policy change". The investigation "analysed 215,349 emergency calls made to the Northern Ireland Ambulance Service (NIAS) during 2010 and 2011". The BBC also received an honourable mention within the data visualisation and storytelling category for national/international media for its "Every Death on Every Road in Great Britain" feature, which enables users to enter their postcode to find data local to them. Jury member Joshua Hatch of the Sunlight Foundation said the interactive was "interesting, informative and engaging".